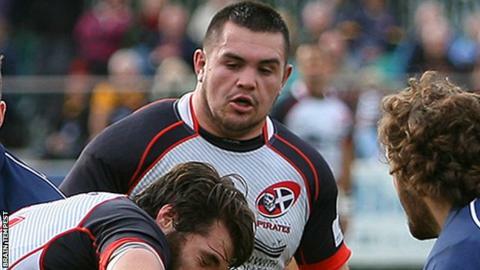 Cornish Pirates prop Tyler Gendall is 'chomping at the bit' to return says director of rugby Ian Davies. The 21-year-old has been out for almost a year after suffering a knee ligament injury against Bedford last October. "He should be back with us in the middle to late October and we'll see if he can kick on again," Davies told BBC Radio Cornwall. "He's chomping at the bit, he wants to play tomorrow, so we've got to hold him back a little bit." The youngster impressed many with the way he adapted to Championship rugby, having joined the club from local league side St Ives last summer. "Tyler was going really well last year and then had an ACL against Bedford," Davies said. "In some respects the past year for him has been quite good as he's been able to work on his upper body conditioning for the rigours of Championship rugby, but at the same time as a rugby player you want to play." Cornish Pirates begin their Championship campaign on Sunday when they host Nottingham at the Mennaye. "We want to play a lot better than when played last year against Nottingham at home. We could still be playing now and we wouldn't have beaten them," Davies added. "Lots of people are tipping Nottingham to be in the play-offs at the end of the season, we want to be in the play-offs at the end of the season, so it's a good litmus test for us to see where we're at."